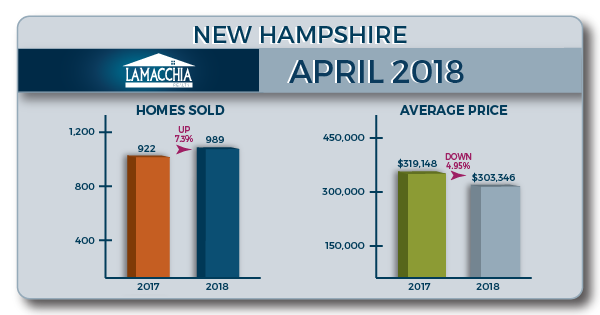 The Lamacchia Housing Report presents overall home sale statistics and highlights the average sale prices for single families, condominiums, and multi-family homes in Massachusetts and Southern New Hampshire for April 2018 compared to April 2017. It also looks at other metrics in Massachusetts like Homes Listed For Sale and Homes Pending, as they are often the best indicators for predicting future trends in the market. 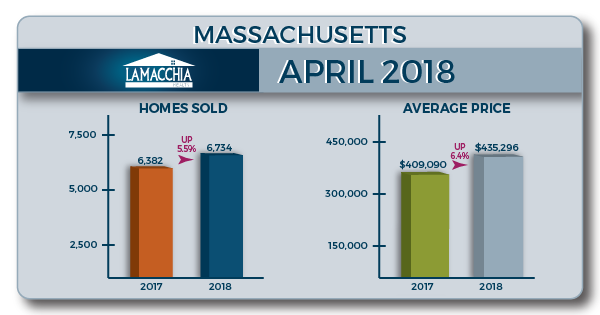 Massachusetts home sales increased 5.5%, from 6,382 in April 2017 to 6,734 in April 2018 with increases in all three categories. Single families increased in sales by 1.34% from the year before. 4,102 were sold in April 2017, compared to 4,157 this year. Condos increased by a strong 15.13% with 1,705 in April 2017 to 1,963 in 2018. Multi-families increased by 6.78% from 575 in April 2017 to 614 in 2018. Overall, prices increased by 6.41% in April 2018, from $409,090 in April 2017 to $435,296. Prices increased in all three categories; multi-families by 4.91%, from $436,601 to $458,043. Single family prices increased 5.58%, going from $451,814 to $477,012 and condos saw the greatest increase of 7.66% with prices moving from $330,000 to $355,271. In April 2017, 10,681 homes were listed for sale in Massachusetts compared to 11,811 in 2018, showing 10.58% increase. This is a strong change from March’s 15.11% decrease. There were 9,367 homes that went pending in April 2017 and 9,684 in April 2018 showing a 3.38% increase- again a positive change from March’s 5.51% decrease. With both listed and pending numbers showing increases, we hope to see numbers up in May. The number of properties sold in Southern New Hampshire increased 7.3% from 922 to 989, again with increases in every category. Condos saw the largest increase of 16.38% going from 232 sales in April 2017 to 270 last month. Multi-families family sales increased 13.04%, now at 52 from 46, and single families increased by 3.57% up to 667 now from 644 last April. The average price for homes in New Hampshire decreased by just under 5 percent. Multi families saw the largest increase of 20.55% going from $195,133 in April 2017 to $235,235 last month. Single family sales increased 3.55%, now at $337,143 from $325,592, and condos decreased by 25.75% from $353,951 last year to $262,813 this year. In our March 2017 Housing Report, with numbers down as they were, we believed we were likely to see this month’s numbers down again which didn’t end up coming to fruition. Numbers are up in every category in Massachusetts, including the number of homes that went pending and were listed. Hopefully, this means the market is hitting its stride for the next few months, so buyers can start to see some selection and sellers will be less concerned about listing and selling before they find the home they want. Sellers should list immediately to take advantage of the low housing inventory before it ramps up and buyers should be happy that the next few months will likely have homes listed in greater abundance as the market tries to find balance.